Although the Black and Yellow editions have variant covers, game contents are the same. The world almost ended seventy-one years ago. A virulent plague came out of nowhere and ravaged the world. For three generations, small groups of survivors have struggled to keep the world alive. Operating from floating stations known as ‘havens,’ they have maintained a loose network of the largest cities by delivering supplies to the mainland. But their efforts are no longer enough. Cities are falling off the grid and supplies are running low. The world needs a group of heroes to emerge and lead it through this crisis. 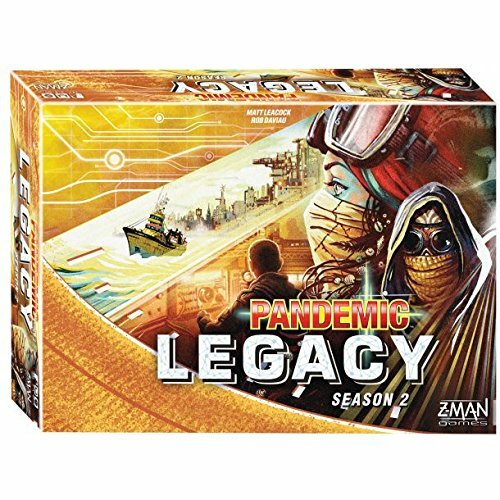 In Pandemic Legacy: Season 2, this task has fallen to you. You must re-establish supply lines and get the world back on its feet. Along the way, the decisions you make affect future games. As you play, you will unlock new components, make new discoveries about your world, and stumble upon secrets that could change the course of history. No matter what happens, though, the world is counting on you. You are humanity’s last chance.